We all love that refreshing moment when we walk from the hot outdoors into a nice, cool building. Or how about when we go down into the basement and find no trace of humidity? That’s always great, right? Nothing worse than a damp and dingy basement. Many of us have grown to depend on household appliances such as air conditioners and dehumidifiers. However, the question remains: what’s the difference and which one of these is overall better than the other? 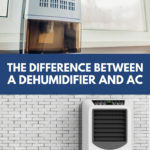 The question of dehumidifiers vs ac is a well-known debate. The answer to this question lies with which one suits a person’s individual needs the best. Let’s have a look at the two and then you can decide for yourself.